Virginia Roth and her late husband, Dennis, were volunteer teachers in Botswana, Africa from 1973 to 1976. There they met and worked with a Pennsylvania couple, Roger and Barbara Eshleman, who were with the same group and volunteering in local agriculture. After returning home, the couples kept in touch, and thirty-five years later in October, 2011, Virginia and a traveling companion, Sylvia, who had never been to Africa, returned with the Eshleman’s to Botswana and South Africa for a three and a half week reunion and adventure. After an airplane breakdown and an unexpected 2 day adventure in Senegal, the travelers landed in Johannesburg, South Africa. In the 1970’s, the Roth’s were denied visas to South Africa, due to the complicated landscape of Apartheid. The new South Africa welcomes visitors, and in Johannesburg, this checkered past was revealed to Virginia and her friends through visits to the Apartheid Museum and the Soweto Township. They remembered the turbulent history of this country and were able to fully appreciate the significant changes that have taken place. The next leg of the nostalgic journey was from Johannesburg to Cape Town on a “compartment” train, little changed in the last 35 years. The spring season was in full bloom, and the desert and the cities were full of spectacular flowering plants and trees. They made the boat trip to Robben Island, the site of Nelson Mandela’s 27 year imprisonment, saw African Penguins (who knew! 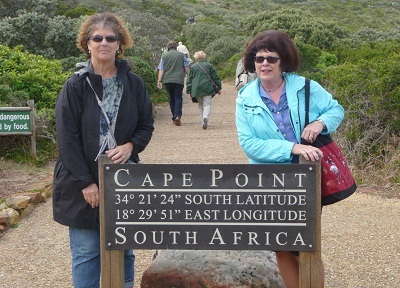 ), and enjoyed breathtaking views at the Cape of Good Hope. From Capetown, they rented a car and followed the Garden Route, with its vineyards and orchards, visited the Indian Ocean, and started the trek through the hills and valleys north to Botswana. Botswana is a relatively stable country, both politically and financially, and though economic progression was obvious, the people seemed little changed, still very friendly and hospitable. Their return to the capital of Botswana, Gaborone, was at first bewildering because of the growth that had taken place, but soon landmarks were recognized, and they felt they were back home again! In Gaborone and in Mochudi (where the Eshleman’s had lived), the travelers visited sites featured in the novel series, “The No. 1 Ladies‘ Detective Agency,” by Alexander McCall Smith. Virginia was intrigued by the series, feeling the narrative was truly descriptive of the Botswana way of life. Near the end of the journey, in the northern part of the country, Virginia was able to return “home” to Selebi-Phikwe, locating the house they had lived in, and the new (in 1975) secondary school site where Dennis, as Vice Principal and Science teacher, had developed a Science Lab. The school is now a much larger institution, but the humble beginnings started so long ago were still there. Virginia and her traveling partners visited two wildlife sanctuaries in Botswana. The first was the Khama Rhino Conservatory. Rhinos in the country were on the verge of extinction until this facility was opened. Other forms of native wildlife - zebras, wildebeest, giraffes, warthogs, lots of birdlife - have been incorporated into the sanctuary to bring the area back to what it was originally - a wildlife area in the central desert of Botswana. They also visited Chobe National Park which has the largest wildlife concentration in Africa! Here they saw all kinds of African animals - elephants, lions, giraffes, zebra, kudu, impalas, Cape buffalo, sable, and many more. One of the highlights was watching a herd of adult elephants supporting a wobbly-legged baby elephant just 1/2 hour old! Another great moment was enjoying breakfast while on a safari amidst a lazy pride of lions! Virginia’s South African trip was amazing and memorable - returning to Africa, reliving many fond memories, and creating some new ones with her friends of a lifetime! And just to prove that Africa is a place that can capture your heart and your imagination, Virginia and Sylvia returned to Africa a little more than a year later in January, 2013 to visit Morocco. Another exciting adventure!